“Suffering has been stronger than all other teaching, and has taught me to understand what your heart used to be. I have been bent and broken, but – I hope – into a better shape.” Charles Dickens, and if you can’t guess the reference, I worry about you. And direct you to the title of the post. I really love Duluth and there certainly are many lovely folks in that wonderful city, but seriously, some of them are straight up crazy. Most of those crazy people are not RWD readers nor are they regular posters on tPB or USCHO; a few of them wander over to Rink and Run when they are out of the straitjacket for an hour of occupational therapy. I don’t really like to run down UMD fans, and I certainly don’t like to run down mentally ill people because really, life’s hard enough for them already, but for reals, people. Just stop with the complaining. 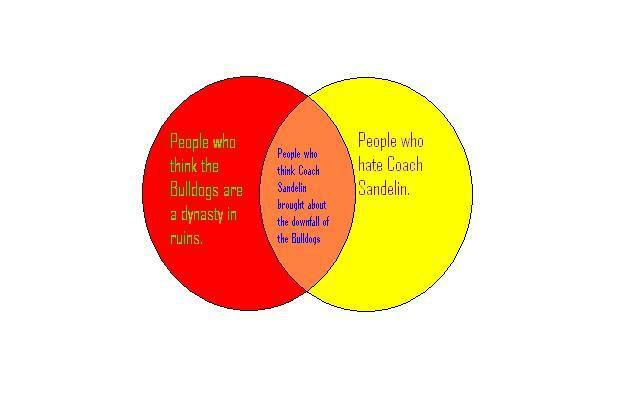 There are evidently people out there delusional enough to think that Bulldog hockey is a dynasty in ruins, and a large subset of those people think that it is the fault of our current coach. Exciting! We’re all learning together, comrades. Now, I love tUMD hockey more than most people love their freaking parents (however, this doesn’t mean I love my parents less than Bulldog hockey; I just have a freakishly large capacity to love, all evidence to the contrary), but there have been more downright terrible years than there have been good years, and so I don’t know from where they are deriving this irrational expectation of college hockey dominance. It is pretty crappy and lame that tUMD has been in the WCHA for, what, 40 years now? and they haven’t been able to string together anything even close to what UND, UMTC, DU or UW have done, but we can hardly blame the current coach nor can we start spazzing at the current players for not winning. FIRST OF ALL, THEY ARE WINNING. Second of all, it’s not their fault that we didn’t win a national title in 1984. Or 2004, for that matter. I mean, some of our best players had probably never even heard of tUMD in 2004. And were any of them even BORN in 1984? (TERRIFYINGLY, NO. And now I’m depressed that I looked.) Just because they don’t win every gosh darn game they play doesn’t mean we need to put stones in our pockets and walk into Lake Superior, or that we need to fire the coach. Now, with that being said, let’s all have a group hug and agree to get behind this team and support them down the stretch. Two sellout crowds is a great way to start! I am definitely going to be smart and buy my tickets for the Anchorage series IN ADVANCE in order to avoid the blind panic of the last two home weekends. Now, ahem, guys. I know you’re out there Googling yourself Ciskie-style to see what the Internets have to say about you and to stroke your egos a bit, which I am okay with because if people were writing about me I’d be curious (I don’t know if they are, because I recently typed myself into the query bar and after 14 pages there wasn’t a single hit that could have even possibly been about me), but in case you surf on over here, let’s have a chat. In three weeks, when the dust has settled, I don’t want to be picking through the wreckage of a season that could have been, eating crow for writing posts like this. Please, please, please, throw your girl a bone here (triple entendre, anyone?) and give me, along with the city of Duluth and the worldwide Bulldog nation, something positive to take away from this season other than “It’s equal to or slightly better than last year.” I know you guys have it in you; seniors, you know what it was like to be on a team heading nowhere at an all-out run and then turn it into a playoff upset and a Final Five appearance. This year’s team is going somewhere at a trot or possibly a canter, and I would like to see something fun. A couple of wins at the X. A couple of wins at Mariucci in February… and then a couple more in March. I don’t know. Get creative. Okay? Thanks. >Kevin Pates is the ONLY media blogger in the WCHA that has links to non-media blogs. >Huzzah, huzzah, huzzah. Great, fantastic post Donna.I get very annoyed with out of whack expectations with sports people. People need to keep perspective, especially with UMD hockey. UMD is a Division II school, which means they’re fighting all-DivisionI schools who have name recognition and other things Division II schools can’t compete with. Sure some D-II or D-III schools can complete sometimes (see Colorado College), but as a whole it’s pretty tough sledding.As you said UMD is winning. They’re making pretty regular appearances in the Final Five. They’re making runs at home ice in the playoffs. They’re making runs at making the national tourney. They’re getting good recruits. They’re sending players to the NHL.At least for now thigs are just fine. Sandlin at the very least deserves to be kept around until a few years after the new arena is done. We’ll see if a new arena changes things dramatically. I’m a little skeptical about that, but it sure would be nice.